Quite often, we want to apply format to specific text portions or phrases; we want to change from lower case to upper case or vice versa. 1. Highlight the phrase we want to change from lower case to upper case. As you can see, the Change Case window has other options which can be used in different moments. 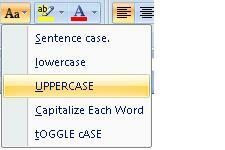 For example, if we want every word in a phrase to be capitalized, we have to choose the Capitalize Each Word option. Now, our text will have that selected format.